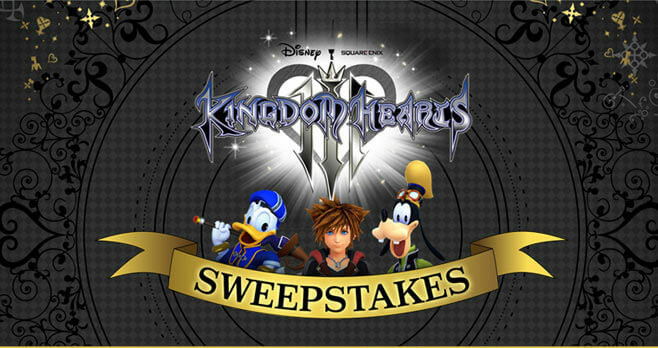 All this month, pre-order or purchase Kingdom Hearts III and be automatically entered in the GameStop PowerUp Rewards Kingdom Hearts III Sweepstakes for a chance to win an entertainment package worth over $2,500. LED Smart TV (Model E70-F3) (Estimated Retail Value (“ERV”) $1,049.99), one (1) Sony PlayStation 4 Pro 1TB Console (ERV $399.99), one (1) Microsoft Xbox One X 1TB Console (ERV $499.99), one (1) Kingdom Hearts III Deluxe Edition for PlayStation®4 or Xbox One (winner’s choice of platform) + Bring Arts Figures (ERV $229.99), one (1) Samsung 5.1 Channel 500-Watt 3D Blu-Ray Home Theater System (Model HTJ4500) (ERV $249.99) and one (1) Disney Blu-Ray Collection (featured in Kingdom Hearts III), which consists of the following: one (1) Hercules Blu-Ray Special Edition (ERV $21.95), one (1) Tangled – 2-Disc Combo Pack (ERV $31.95), one (1) Monsters University 4-Disc Ultimate Collector’s Edition (ERV $36.95), one (1) Frozen Blu-ray Collector’s Edition (ERV $26.95), one (1) Big Hero 6 Collector’s Edition Combo Pack (ERV $26.95), one (1) The Complete Toy Story Collection 1, 2 and 3 (ERV $34.99) and one (1) Pirates of the Caribbean: 5-Movie Complete Collection (ERV $35.99). Visit www.gamestop.com to enter and see Official Rules for details.